935M Apartments in Atlanta makes luxury living in the city affordable and pleasurable. With the A4 Pelham, you have a one-bedroom, pet-friendly apartment in a great area, packed with high-end amenities and benefits. Partner that with 810 square feet of living space, and you have a great fit for your new residence. Our A4 Pelham unit boasts 10-foot, floor to ceiling windows that provide a lovely view of Atlanta’s notable skyline. Well- appointed gourmet kitchens are standard in every unit at 935M, as well as granite countertops, and an energy efficient, stainless-steel appliance package. 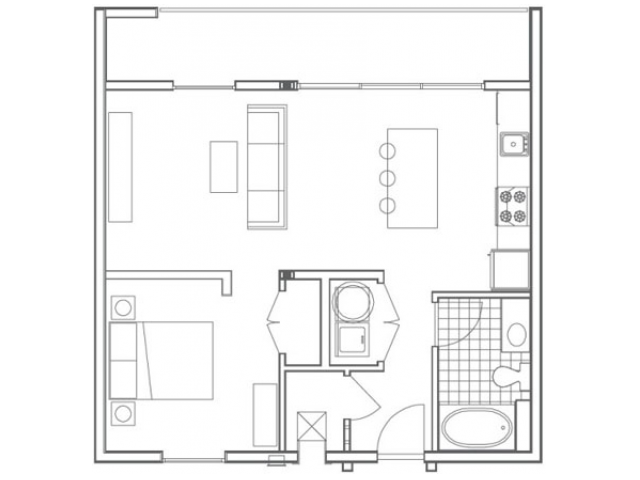 You will have in-unit washer and dryer hook-ups, walk-in closets and a deep soaking tub with the A4 Pelham. 935M has created an escape from living in one of America’s largest cities. Conveniently located near Georgia Tech, 935M is a great option for staff and students. The west side of Midtown is a vibrant neighborhood that is close enough to walk to local restaurants like Pauley’s Crepe bar and shops, but far enough from downtown that you can breathe. Your proximity to I-85 puts the rest of Atlanta just minutes away. We are incredibly proud of our friendly staff, who take the time to meet the needs of our residents with care. If any services or requests come-up, you have a convenient resident's portal for maintenance request, and to pay your rent. At 9335M, luxury living is at your fingertips. Stop by today for a walk-through and tour our facilities.